Take the opportunity of scuba diving in the pure waters of Marmaris to see the amazing coral reef pattern and colorful fish. It’s an amazing experience that you must see to believe. The waters of Marmaris provide you with an excellent opportunity for an underwater adventure. On this tour you will have 2 dives including lunch. These dives enable beginners and seasoned divers to explore the clear waters of Marmaris. It is an ideal place for diving as the water is clear and warm, and there are strict underwater activity laws. Before you make the first dive, you will be briefed about the technical details of diving in the waters of Side. You will easily learn how to make use of your underwater diving gear and explore some fascinating caves and swim with the exotic fish. 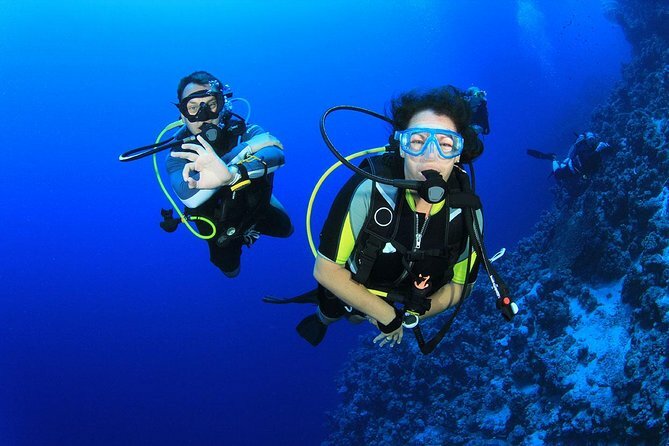 A high quality of diving-service makes sure that the divers remain safe and have a memorable experience. After a few try-dives and skill tests, you can progress further to experience the amazing and colorful underwater life.